Durban’s beachfront has always been a haven for fun in the sun and a place for all Durbanites to enjoy the City’s idyllic weather and beachside activities. Over the last ten years, the sandcastles of old, that were a hallmark of our beaches, have had a serious facelift. Silhouettes depicting iconic city landscapes such as Moses Mabhida stadium, alongside life size interpretations of wildlife, newsworthy personalities and events, have appeared along the Golden Mile; but instead of the brick and mortor of the originals, the city sights are sculpted out of sand. The impressive array of sandcastles have become synonymous with our coastline and an integral part of a process of developing Durban’s beachfront into a living gallery of original artwork. Co-ordinated by Street Scene and Intertwine and supported by Celebrate Durban, the KwaZulu-Natal Institute of Architects (KZNIA) and UIA2014 Durban, the annual DURBAN SANDCASTLE CONTEST celebrates the unique crafters of our beachfront sand sculptures. 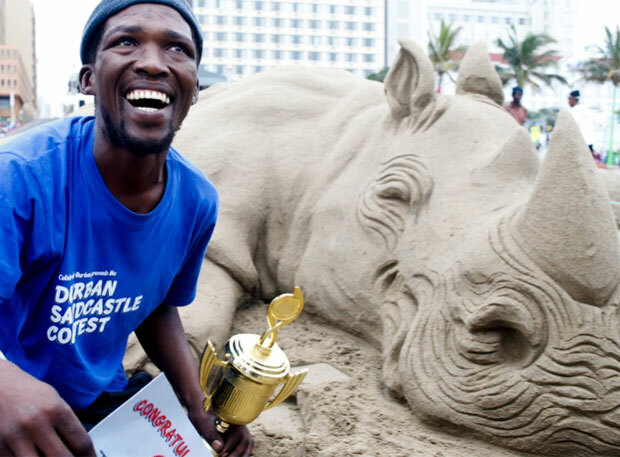 To take this year’s event to a new level, Mark Mason from the United States, the current World Record holder and former World Champion, art sculptor/ sandcastle builder, will conduct a three-day workshop for Durban’s registered Sandcastle artists as part of a skills development program, as well as act as one of the judges, for the event itself. Potential competitors can enter one of three categories, all of which will revolve around an architectural theme, in light of the upcoming International Union of Architects World Congress, UIA2014 Durban, set to take place in the city next. World Architecture Day will also be taking place on 7 October 2013 with the theme Architecture: Culture. The event will take place at Durban’s New Beach on Saturday the 28th September, starting at 9:00am and locals and visitors alike are invited to get down to enjoy a full day filled with fun, creativity and great cash prizes. Registration for the open category will start at 8:30am on the day Competitors are urged to get ito New Beach early to avoid missing out, as entry is limited.